Key Biscayne is an island town in Miami-Dade County located between Crandon Park and Bill Baggs Cape Florida State Park, with the Atlantic Ocean on the east and Biscayne Bay on the west. The small island town was incorporated in 1991. 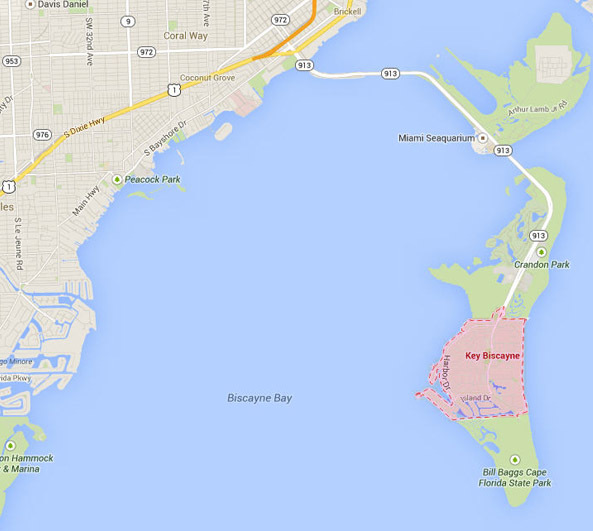 Because of its location, low elevation and direct exposure to the ocean, Key Biscayne is one of the first areas in Miami to be vacated during an approaching hurricane. The original residents of Key Biscayne were Tequesta Indians of the Calusa nation. Ponce de Leon discovered the land he called Santa Marta and claimed it for the King of Spain in 1513. The land was then granted to Pedro Fornelis. In 1821, Florida became a territory of the United States and Mary Ann Davis of St. Augustine purchased the island from the Fornelis family for $100 and 3 acres of that land was sold to the United States government for a military reservation for $225. Shortly after, a lighthouse was built and first lit in 1825. However it did not last long before Seminole Wars attacked and burned the lighthouse in 1836. The lighthouse was rebuilt and relit on April 30, 1847. The Davis family began to slowly develop Key Biscayne in 1839 with few lots being sold. Coconut palms and pineapples were planted all over the Key. There were occasional ship raids by pirates. William John Matheson was a successful industrial and purchased land north of the Davis property in Key Biscayne, where he developed a coconut plantation and other experimental fruit groves. He worked with David Fairchild, an American botanist and plant explorer. Matheson and his family created a community on the plantation which included schools and a zoo, as well as the formation of Pines Canal that helped with the access of trading and navigating between Biscayne Bay and the Atlantic. Like much of South Florida at the time, Key Biscayne was greatly affected by the hurricane of 1926. The Matheson family had to rebuild most of the plantation and made a deal with Dade County to donate the northern half of the Key to the public in exchange for a causeway that would connect Key Biscayne to the mainland. In the mid 1950s, homes were built to target veterans, as well as Key Biscayne Villas, a shopping center and much more. Today, Key Biscayne is home to a diverse community of business leaders, professionals, Latin-American residents, European residents, and retirees. The community borders about 30 acres of Atlantic beach. The public parks in Key Biscayne include Lake Park, East Enid Linear Park, Ocean Park, Village Green, and Calusa Park. Lake Park is almost 1 acre in size with a small pavilion for shade that overlooks the lake. East Enid Linear Park is about ½ a mile in length with a walking path leading to Ocean Park, which has a pavilion and shower facilities. Village green is 9.5 acres and an active park with multi-use open fields, a children’s play area, a small shade pavilion and a jogging course. Bordering north of Key Biscayne is Crandon Park, a popular family park with beach and marina, golf course, tennis courts, and children’s play area. South of Key Biscayne is Bill Baggs Cape Florida State Park, with beaches, a lighthouse and a cultural center. There are tours for the historic lighthouse. The park offers beach chairs, kayaks, bicycles, windsurfers, and rollerblades for rent. The only Miami-Dade County public school in Key Biscayne is Key Biscayne K-8 Center. Some of the options students have for schooling are attending Coral Gables Senior High or MAST Academy, also known as Maritime and Science Technology Academy. The academy is a magnet school that focuses primarily on marine studies. The private schools designated for Key Biscayne include St. Agnes Academy, Key Biscayne Community Church Day School and Key Biscayne Presbyterian Church School. The community of Key Biscayne today is not just a destination for “snowbirds” but also a place for growing families. Key Biscayne welcomes everyone as it is a great place to enjoy the beaches, parks and all of its amenities. If you have any interest living in Key Biscayne, contact us and we will assist you with your real estate needs.